A cup of tea in Donaghadee? "True Grit" and "Protestant Hymns"
BBC - "We're Fur Hame"
Hugh's Fish Fight - sign up! "Beware the Ulsterman, my son"
If you do a Google search for Café Manor in Donaghadee, it gives six alternatives that you could try instead under the title "Related Places". Three of them are in Scotland. Click here and see for yourself. The first two programmes of this new series have already been broadcast on tv, and are currently available on BBC iPlayer. The series tells the story of a group of American tourists who arrive in Ulster with Glen Pratt (President of the Ulster-Scots Society of America) in search of branches of their family trees and the heritage of their emigrant ancestors. It's clearly an emotional experience for many of them, and is definitely worth watching. You'll also spot some well-known local faces. Along with UTV's "Plantation - the Truth and the Legacy" which was broadcast before Christmas, and next week's simulcast of Senator James Webb's "Born Fighting" on UTV and STV, it is encouraging to see our stories emerging from the shadows, being well told, and reaching a wider audience. First two episodes are on the BBC iPlayer here. More information available here and here. This was scanned from a collection of poems which had appeared in the Irish News, spanning a period from 1938 to 1960; the book itself, "Lays of an Ulster Paradise", was published in 1960. The poem is a satire, attacking aspects of policy within the Stormont goverment of the time. 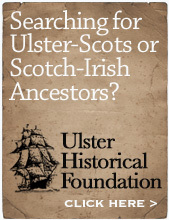 However it does show that there was an awareness of Ulster Scots identity back then. Hae a guid Burns nicht. 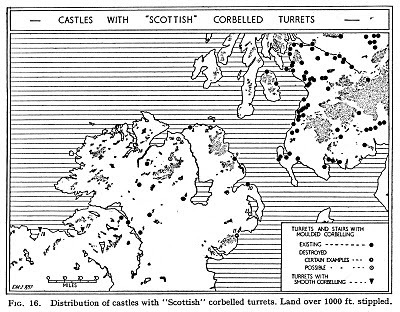 From the same book mentioned below, published in 1952, here's a map which dares to acknowledge that Scotland exists! It's not very clearly drawn, and so it's hard to make out the detail, but what it does show is an understanding on the part of the authors that Scotland has exerted an influence beyond its shores, and that there are similarities on both sides of the narrow sea. 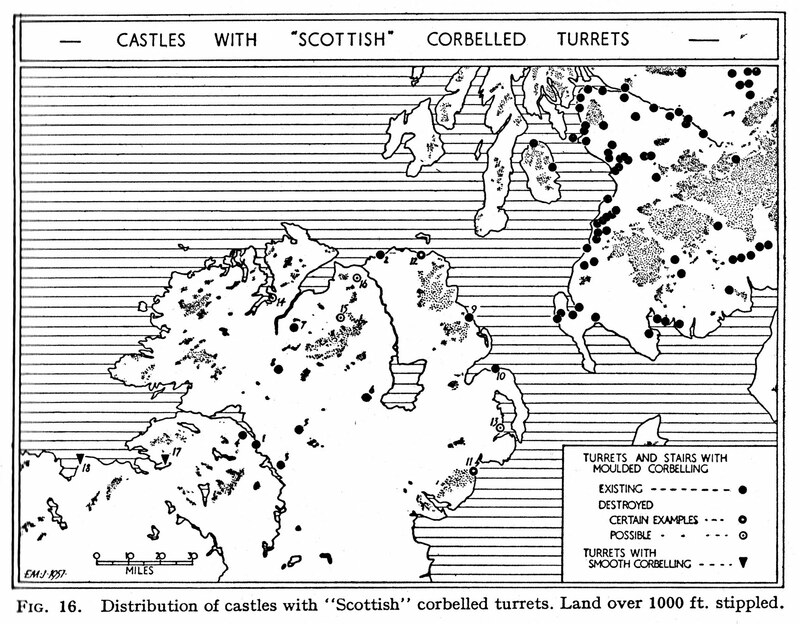 In the case of this map, it's a survey of the common architectural styles of castles. But how often do you see vision like this today? For all of the political promises about "East-West" linkages, there are none of any real significance. We are stuck in a two-tribes "Hiberno-centric" society where perspectives are limited to this island - in almost every area you can think of. When is the "Shared Future" going to reach across the North Channel and acknowledge the similarities we still share with Scotland? The policy-makers need to take a far, far wider view. ...because they don't get any recognition. 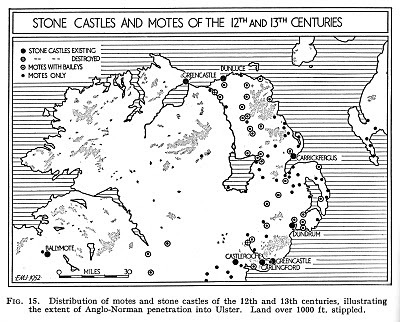 The map below is from a book published in 1952, which shows the locations of the Anglo-Norman castles and motes in Ulster. These were built following the arrival in 1177 of John de Courcy. In 1210, King John (of Magna Carta fame) visited Ireland - 2010, the 800th anniversary of this, came and went and as far as I'm aware nobody commemorated it. Yet in many cases it was the Anglo-Normans who were responsible for the building of castles and churches which the later Scots then extended or refurbished. Dunluce Castle is a good example of this, originally built in the late 1200s by Richard de Burgh, the Anglo-Norman 2nd Earl of Ulster. But it's often only talked about today as having been a MacDonnell castle, because of the (originally Scottish) Macdonnells who took control of it three centuries later, in the late 1500s. Conversely, at Grey Abbey, the Anglo-Norman origins of the Abbey are well articulated - and yet the role of the later Scots who revitalised the ruins and restored worship there is unfortunately downplayed. 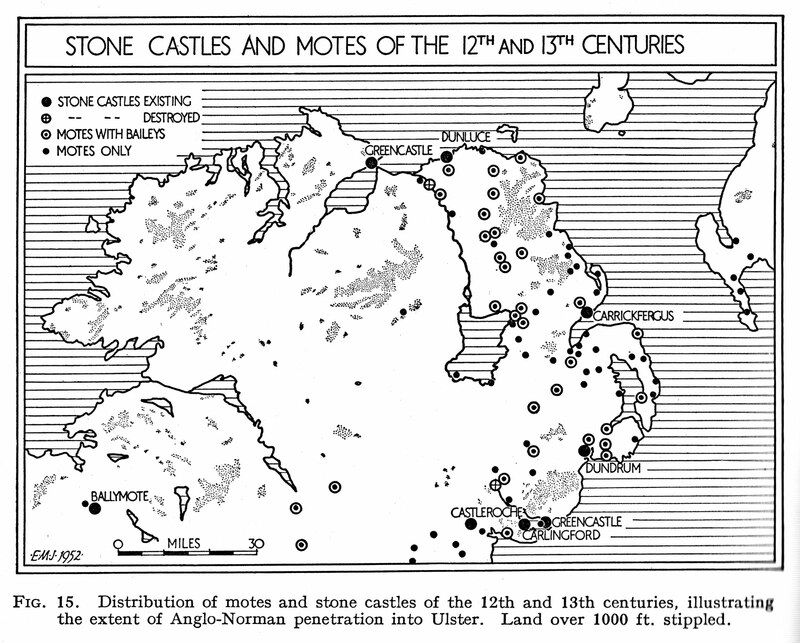 There are other similar examples in Antrim and Down, as the map shows. Ulster has a three-way cultural triple blend of Irish, English and Scottish influences. 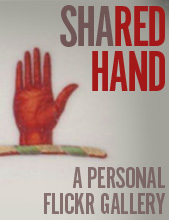 To tell the true story, all three strands must be presented. "Irish music all sounds alike, how can you tell the tunes apart?". "By the titles". Readers from mid Antrim and the Braid will know more about this castle than I do. But here's a summary from what I do know. The Adairs Scottish roots go back to 1315, when they were granted large area of land of Kilhilt/Kinhilt on the Mull of Galloway by King Robert the Bruce, as a reward for having fought alongside him. After seven years of battling the English, Scotland (and Bruce) was close to broke - but there was plenty of land and so he granted many of his closest allies large estates. Move on 300 years to the early 1600s and the entrepreneurial Ayrshireman Sir Hugh Montgomery, already well established in County Down, wanted to control the major Ulster-Scottish sea route between Donaghadee and Portpatrick. So he bought much of the Adairs Galloway estates. They pocketed the money and, like so many of their generation, left south west Scotland for east Ulster - they headed to mid Antrim where they bought some of the old McQuillan estate (the superbly-named Faithful Fortescue also had a holding there). They built a castle in Ballymena, and streets in the town are still called Kinhilt today. 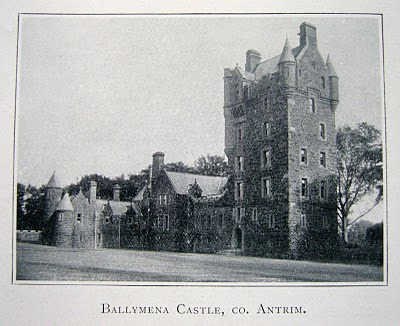 The photo below was taken around 1900, of the second Adair castle which was built around 1850 by Lord Waveney, Robert Adair, on the site of the original one. Folk have told me that the last wheen o' stanes of the castle were removed in the late 1980s to make way for the Seven Towers Leisure Centre and the other retail outlets that surround it. But apparently the stone coat of arms from the castle was salvaged and is now in a dentist's surgery somewhere in the town. The Adair's home castle on Galloway had been Dunskey Castle, which Montgomery acquired with the estate. It was said to be a haven for strange wee Scottish ghosts...! It's effectively the first recorded golf course and football pitch in Ireland, beside the "great school" which Hugh Montgomery had built in Newtownards around 1620. In the latest edition of Ulster Folklife (Vol 54), historian Andrew Steven analyses all of the documentary and topographical evidence and concludes that it was in the area now known as Movilla Street and Greenwell Street. The school principal was John McClelland, who was one of the four ministers on board the emigrant ship Eagle Wing in 1636. PS: As an aside, local folk will remember the day in the early 1980s when Strangford Lough, after centuries of retreat, suddenly reverted to its ancient high water mark and just kept coming in, flooding the flat ground of the whole Portaferry Road area, right up as far as the Old Priory where the Montgomeries had built the school and also their first house. The present-day floodgates were built shortly after this incident - but back in 1744, Walter Harris wrote that "the old house of the Mountgomery family stood pleasantly seated on the edge of the Lake". I'm trying to find the precise date of the flood - any help would be appreciated. Two words from a conversation of last week. I'm not going to give any definitions, look them up for yourself! Over 500,000 people have signed up to support the campaign. If you haven't yet, click here. "...I am more afraid of my own heart than of the pope and all his cardinals. I have within me the great pope, Self." Thanks to Robert Campbell for letting me know about this, a new podcast from Russell D Moore. Hank Williams' I Saw the Light is the subject of this first episode, which he describes as "The National Anthem of the Christ-haunted South". "We need to pay attention to the theologies of John Calvin and John Wesley, yes. But sometimes we also ought to pay a little bit of attention to the theologies of Johnny Cash." Click here. It's an excellent, thoughtful, piece - and I hope future episodes are as good, if not better. This event was filmed at High Kirk in Ballymena last Sunday, giving a flavour of the "Psalms Roadshow" events. The next two are at Banbridge 5th Feb / Orangefield 5th March. (I'm not involved in this, but just thought it would be of interest to some of you). GCSE Latin was 24 years ago, so I won't hazard much of a translation of this - a detail from a beautiful map of Ireland dated 1572, referring to Sir Thomas Smith's attempt to colonise the Ards with Englishmen: "Hanc insule partem Anglis incolendam dedet Elisabetha Anglie regina Coloniaque duceta est Dno Smetho equite aurato 1572"
Here's the website where you can sign up and support the campaign. A web-based project appeared during 2010, capturing thousands of field recordings from Scotland from the 1930s onward. Tobar an Dualchais / Kist O Riches is a collaboration among the University of Edinburgh, BBC Scotland and the National Trust for Scotland as well as some other funders. You could lose a few days of your life in it. "...A government edict was put out that all would observe the fast days proclaimed by the government. The penalty for anyone caught working on a fast day would be the confiscation of all the oxen and horses belonging to the culprit. One old farmer in Nithsdale, Armstrong by name, who had a troop of redcoats stationed nearby, yoked his ten brawny sons to the plough and worked the full day without the least molestation by the troopers..."
I heard this the other day: "you can either have a tiny empire of control, or a large network of influence." Which would you rather have? I've posted a potted biography of William L Thompson here; the family traced their roots to near Ballymena and then back to Covenanter Scotland. 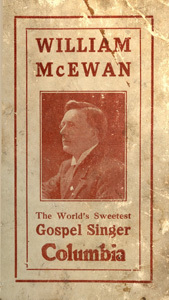 He was a great songwriter and hymnwriter of his generation, who later became a music publisher and instrument retailer. This year will see the broadcast of a two-part series entitled "Born Fighting". It will be presented by Senator James Webb, author of the book of the same title. Some of the filming took place here in Northern Ireland last August, and Senator Webb spent some time here interviewing a number of people. I provided the producers with a bit of help on sourcing visual material. The series is a three-way collaboration between the Smithsonian Channel, Scottish Television and Ulster Television. More info to be posted here when I get it. Great footage, two great musicians. When two voices, an old guitar, and a hand-held video camera can do this with an old Creedence Clearwater Revival song it fair sickens ye! One of the things I stumbled on over Christmas was a very interesting programme on Radio Ulster. "Rock of Ages" tells the story of the music and musicians that have emerged from CFC Church in Belfast. The programme summary is: David O'Reilly looks at how a group of young Christians changed the face of popular music in Northern Ireland. Featuring Duke Special, Two Door Cinema Club and Brian Houston. I know some folk who go to CFC, and while it's not quite my cup of tea on a range of fronts, I'm not going to be critical of others just because they do things differently. What is important is that this might be the first time that the media/arts sector has given public recognition of the present-day influence of gospel music in Northern Ireland. The story is far bigger than just CFC, and far bigger than just the present day, so I hope this is just the first step. Well done to all involved. You can also read about the programme here on Stuart Bailie's blog. Click here to listen to it on BBC iPlayer. • in the Memoir, Meikle is referred to as "a young author of whose talents I had heard him [Pollok] speak very favourably". They visited Burns' country together, along with a fellow student who may have been from Ireland called David Marr (graduated 1824, died 17 May 1834, aged 37. Marr went on to become minister of a Presbyterian Secession church on Lothian Road in Edinburgh). During the trip Marr tried to sell some of Meikle's poems to local people, claiming that they "are all in the Scottish dialect, and said to be as good as Burns". They travelled southwards, eventually reaching the hills above Cairnryan with a view "along the far coast of Ireland. This was a scene that your brother [Pollok] esteemed worth all the fatigue of their journey; and they gazed on it till it became shaded in the dimness of approaching night." The Memoir records that Pollok's g-g-grandfather, David Gemmell, had fled for refuge to Ireland for three years during the brutal "Killing Times" of 1660-1688. Perhaps the view across the water to Ulster, and Covenanter stories along the way, made an impression upon young James Meikle? • he came to Belfast in the early 1800s to take a position as a teacher at Brown Street Daily School. His lectures were "distinguished by originality of thought, great enthusiasm in the cause, and a peculiar manner of illustration, that stamped him at once as an orator and a man of genius". • his first book, "Our Scottish Forefathers", is a tale of two Ulster Presbyterian ministers who visit Ayrshire. In the story an old man gives them a collection of rare 17th century manuscripts which had belonged to one of the early Scottish settlers in Ulster, which are first-hand accounts of the major events of the early 1600s. • When Dr John Ritchie of Edinburgh, "the Goliath of Voluntaryism" came on a speaking visit to Belfast in 1837, it was Meikle who publicly debated him. The debate was recorded in the newspapers of the time. Ritchie (also known as "Potterrow John") had been in Belfast in March 1836 to debate the same subject, that time his opponent was the renowned Dr Henry Cooke. For Meikle to be seen as an able deputy for Cooke gives some indication of his ability and the esteem in which he was held. • when at home in Scotland, Meikle visited the hillside graves of Covenanters - "bending over the graves of the martyred sires of his country, awaken the sleeping echoes of the hills as they mournfully responded to the names of Hamilton and Guthrie" - presumably the famous Scottish martyrs Patrick Hamilton and James Guthrie. • he left Belfast for the English Lake District where he became a teacher in the village of Aspatria, and worked particularly for the education of blind people. • he also became Secretary of the Edinburgh Bible Society, in which role he addressed the 1842 Presbyterian General Assembly at May Street Church in Belfast. • he died on Tuesday 9th August 1842, his final address being 16 Gilmore Place in central Edinburgh. 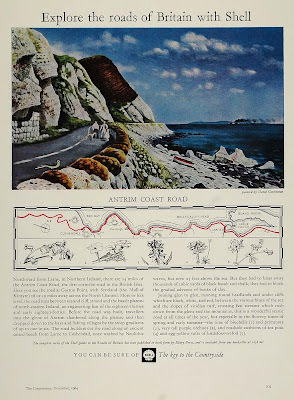 '...But we pass from what Killinchy is, “and up the stream of time we turn our sail” to days when its desert state, long unfamiliar with the scythe or the plough-share, was invaded by the hand of industry, and fertility spread over wastes unbeautified, but by the hues of the wild-flower and diversified only by the change of the passing seasons. “Sighed their adieu to their father-land. Amongst those Scottish emigrants who settled in the parish of Killinchy was William Hamilton. In the spring of 1610, he entered upon the possession of the farm of Ballybreagh. A considerable part of summer was spent in repairing the dwelling-house, which was in a state of almost entire dilapidation, and in erecting the necessary appendages of barn, byre and stable. These operations were so far advanced by the beginning of harvest that he removed his family from Scotland. His children though they had left the home of their infancy with sorrow and regret, were not a little gratified at finding a home ready for their reception in the humble farm-house of Ballybreagh; and, although it was destitute of the pleasing associations of Knowehead; yet it possessed one charm, powerful and heart-stirring – it was their own, the house and home of their father. "...But while William Hamilton increased in outward prosperity, he began to forget the “God of his fathers.” In a short time after the world promised well, he began to neglect those spiritual exercises, which, while the gloom of poverty surrounded him had been his only solace and support. The farm and the market now engrossed more of his attention than the devotional services of the family-altar. It is true he did not abandon altogether the observance of social praise and prayer, but only occasionally permitted the hour of the morning or the evening sacrifice to be engrossed by the hurry and business of the world. He still endeavoured to keep up in the eyes of men the character of a Christian, and frequently resolved when a more convenient season should arrive, to resume the regular discharge of sacred duty. Yet it so happened that as the delay continued, the desire was weakened, and by degrees languished into the faintest image of a momentary regret. It is a fearful thing to abandon the high ground of christian principle and profession – to descend from the elevated region of practical holiness – to forego the enlivening refreshment of daily communion with God, and by too keen a pursuit of worldly good to allow the pleasures of piety to lose the savour of superlative bliss to the soul. Very little is known about James Meikle; he is believed to have been born in Scotland. He also authored another book called Our Scottish Forefathers which was published in Belfast in 1836. He is thought to have died in 1842, probably in Scotland. What is particularly interesting is that Meikle was very well informed about the history of the 17th century Ulster Scots, a good few decades before the most important manuscripts from that century were eventually printed as books by commercial publishers in the mid/late 1800s. That he sought to popularise the history through creative writing is also significant - was he seeking to educate his readers, or was he tapping in to a ready market for a story that people already knew? James Seaton Reid's History of the Presbyterian Church in Ireland had been published in 1834 and was a hugely influential telling of the Ulster-Scots story. Some of this history had trickled into print earlier, in the late 1700s and early 1800s. The Belfast News Letter had printed excerpts of the Montgomery Manuscripts in 1785/1786 (1786 was also the year that Robert Burns' poems were first printed in Kilmarnock - extracts were printed in the Belfast News Letter that same year) and also again in 1822. They then issued a small bound edition in 1830, the Preface of which indicates that its intended audience was "gentlemen" and "those who have studied". However, the publishers were clearly conscious of the need to also pick up sales among the general public; the Preface also says that the publishers hoped that it might "engage the attention of the majority", and there is also a reference to their efforts to issue the book at an affordable price. The major printings of the early accounts of the County Down settlements took place after Meikle's death: George Hill's exhaustive footnoted edition of the Montgomery MSS appeared in 1869, the Hamilton MSS in 1867, Adair's Narrative in 1866, Robert Blair's Autobiography in 1848, and so on. James Meikle is an obscure figure, but he may well have been the first to try to "package" the story of the first major Ulster-Scots settlement in a popular novel, centred upon a specific locality. Thanks to William Lytle of Edinburgh Books for posting this fascinating excerpt from the 1915 book Malice in Kulturland on his blog. My copy of Robert Blair's autobiography was from William, I've never been to his shop but plan to call in the next time I'm over. After twenty years of shaving himself every morning, a man in a small town decided he had had enough. He told his wife that he intended to let the local barber shave him each day. He put on his hat and coat and went to the barber shop, which was owned by Pastor O'Loan of the town's Baptist Church. The pastor's wife, Grace, was working that day, so she performed the task. Grace shaved him and sprayed him with lilac water, and said, "That will be £40." The man thought the price was a bit high, but he paid the bill and went to work. The next morning the man looked in the mirror, and his face was as smooth as it had been when he left the barber shop the day before. Not bad, he thought. At least I don't need to get a shave every day. The next morning, the man's face was still smooth. Two weeks later, the man was still unable to find any trace of whiskers on his face. It was more than he could take, so he returned to the barber shop. "I thought £40 was high for a shave", he told the pastor's wife, "But you must have done a great job. It's been two weeks and my whiskers still haven't started growing back." Expecting his comment, the expression on her face didn't even change. She responded, "You were shaved by Grace O'Loan. Once shaved, always shaved."